While only a few more weeks of summer remain, there’s still plenty to do before the season is over. Several outdoor festivals are taking place throughout Manhattan in August, so you can shop and eat your way through various cultural hubs and make the most out of these last few weeks of warm weather. These street festivals offer hundreds of great exhibits, which include local arts and crafts, antiques, jewelry, and authentic foods. They're also a venue for various nonprofit, government and corporate entities, all trying to engage your involvement or elicit support or business. 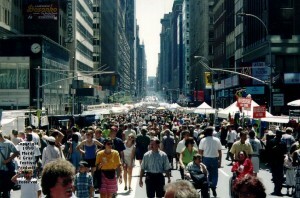 NYC festivals typically have lots of quirky artwork exhibits and tasty, ethnic cuisine from all over the world, along with the traditional festival food options (i.e. grilled corn on the Cob and funnel cake). Plan on coming hungry and bring lots of cash, as most vendors aren't set up for credit card sales. The kids won't feel left out either. The Summer Seaport Festival is a must for those with young children in tow, as it will embody an old-fashioned seaport carnival with a petting zoo and hay wagon rides. Shopaholics should consider any of the festivals, which generally sell all manner of goodies from sunglasses to plants and CDs, all at very reasonable prices. Again, most sales are cash only. Admission to the festivals listed below is free and open to the public. These outdoor events generally run from 10am to 6pm, but it’s best to go towards the beginning of the day to beat the crowds and avoid long lines at food stands. And there’s still one more week of the wonderfully free Broadway extravaganza at Bryant Park. 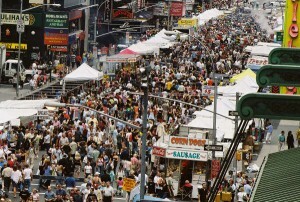 Visit http://www.clearviewfestival.com/ or http://www.nycstreetfairs.com/ for more information on specific events. This entry was posted on Tuesday, August 10th, 2010 at 12:46 am	and is filed under Stuff to Do. You can follow any responses to this entry through the RSS 2.0 feed. You can leave a response, or trackback from your own site.